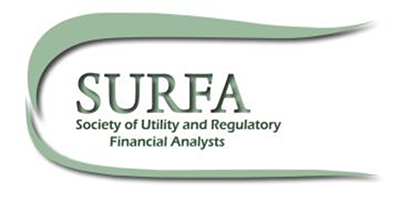 In 1996, the name of the Society was changed to the Society of Utility and Regulatory Financial Analysts (SURFA). Despite the name change, more than thirty years later, SURFA is a highly-respected and widely-recognized organization whose objectives continue to remain the same. To advance and foster the society’s objectives, SURFA presents an annual Financial Forum on a variety of topics related to rate of return analysis and sponsors the Certified Rate of Return Analyst (CCRA) Program. The Annual Financial Forum of the Society of Utility and Regulatory promotes better understanding of current cost of capital issues affecting the regulated utility industries — energy, water, and telecommunications. The program will be of interest to rate-of-return professionals and financial analysts as well as regulatory commissioners and staff, consumer advocates, attorneys, accountants, and consultants. The Certified Rate of Return Analyst (CRRA) program was initiated in 1990 as an educational service of the Society. The purpose of the program is to aid practitioners in acquiring knowledge relevant to rate of return analysis, to recognize the candidate’s knowledge level and to enhance awareness of the regulatory rate of return process. The program focuses on understanding the mechanics of rate of return analysis and is intended to be unbiased in that no single technique or approach is favored. (check made payable to SURFA). Questions and inquiries may be directed to the email address or phone number below. Candidates who withdraw from the program may receive a $175 refund (half) only upon written request through March 27, 2019. There are no refunds after March 27, 2019. A candidate who withdraws from the program before March 27, 2019 may elect to forego the $175 refund and take the exam in 2020, provided the candidate pays for any increase in the registration fee and for the cost of any new study materials. In this event, the refund policy applicable in 2020 will apply. Additional conditions may apply. A candidate who takes the exam and does not pass is not entitled to a refund but may take the exam again in 2020, subject to the payment of applicable registration fees and the cost, if any, of new study materials. Additional conditions may apply. CRRA candidates will be sent a copy of The Cost of Capital – A Practitioner’s Guide (10th Edition) to serve as a study guide in preparation for the exam. This publication is also available through SURFA to the general public for $40 including shipping and handling (plus 5.3% sales tax for Virginia registrants). The CRRA is available only to SURFA members and membership is required to obtain and sustain the CRRA designation. The CRRA is available only to SURFA members and membership is required to obtain and sustain the CRRA designation. The fee to sit for the exam is $350 and membership in SURFA is required (additional $100 fee). The registration deadline for the 2019 CRRA exam is February 15, 2019 and the exam will be given on Wednesday, April 3, 2019 in conjunction with the annual Financial Forum (separate Financial Forum registration required). CRRA candidates will be sent a copy of The Cost of Capital – A Practitioner’s Guide (10th Edition) to serve as a study guide in preparation for the exam. This publication is also available through SURFA to the general public for $40 including shipping and handling (plus 5.3% sales tax for Virginia registrants). For more information, see the CRRA Certification link at the bottom of the home page.